Cheim & Read is pleased to present eight monumental black and white paintings, dating from 1967 to 1969, Al Held (1928–2005). An exhibition of Held’s “Alphabet Paintings,” made between 1961 and 1967, was exhibited at the gallery in 2013. This exhibition focuses on the unique series of paintings Held began in 1967, in which various geometric forms, arranged in multiple perspectives, are rendered within the strict confines of a black-and-white palette. Perhaps inspired by the India ink drawings of lines, circles, triangles, and squares that he made in 1966, Held had already begun moving away from the flat, boldly-colored shapes of his earlier work. Using charcoal and white acrylic directly on canvas, he started sketching multi-dimensional, interlocking configurations, surrounding them with colored ground. In late 1967, this experimentation yielded to an increasingly graphic, complex, and illusory space. While compositions were still worked out on the canvas, often in several iterations, Held’s soft-edged charcoal was replaced by the sharply defined contours of uniformly painted forms, their thick black outlines positioned against a stark white field. The paintings featured in this exhibition encompass the initial phase of this new body of work. 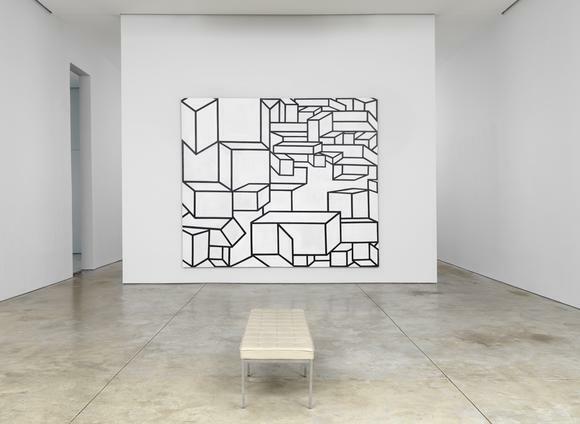 The “B/W series” is comprised of Held’s first fully realized canvases in his new style and limited palette, while works from the “Phoenicia” series are more explicit in their development of multiple perspectives and vanishing points, resulting in evermore ambiguous spatial relationships. As with his earlier work, Held painted on a monumental scale; the majority of these canvases measure over nine feet tall. Held was born in Brooklyn in 1928. After dropping out of high school, he joined the Navy, and served from 1945-47. In 1948 he enrolled in the Art Students League in New York, and from 1950-53 studied at the Académie de la Grand Chaumière in Paris. In 1959, Held had his first solo exhibition in New York at Poindexter Gallery. In 1968, his early black and white paintings were shown, initially through the Andre Emmerich Gallery, and then in a solo exhibition at the Institute of Contemporary Art, Philadelphia, PA (which travelled to the Contemporary Arts Museum, Houston, TX). Held’s work has been exhibited extensively and is in the permanent collection of many institutions including the Kunstmuseum Basel, Basel Switzerland; Smithsonian American Art Museum, Washington DC; the Metropolitan Museum of Art, New York; and the Museum of Modern Art, New York. The Al Held Foundation is represented by Cheim & Read. The gallery will host a panel discussion on Thursday, February 25, from 6:30-8:00 PM. Panelists include Alex Bacon, Phong Bui, Odili Donald Odita, Judy Pfaff, Irving Sandler and Elisabeth Sussman.